I will be having a spring sale next thursday on my facebook page to say thank you to my lovely customers! I will only be selling about 25 items this time so we should be done in two hours or until sold out - which ever comes first. 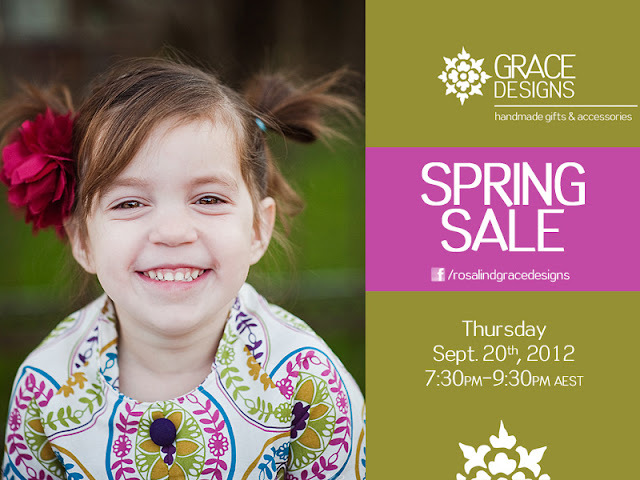 Grace Designs is having a Spring Sale to say thank you to my lovely customers - that's you! The sale will be held on Thursday night 20th September 2012 from 7.30pm - 9.30pm (or until sold out). There will be approx 25 items: A mix of adult and children's headbands, sml amount of hair pins, a couple of combs/fascinators. OOAK and old favourites. A fabulous way to get organized for Christmas, top up your present stash or treat yourself! 1. I will post PHOTOS and DESCRIPTIONS of each item with their discounted PRICE on my Grace Designs Facebook page over a two hour period. Don’t forget the first to comment gets the item, so make sure you don't miss out! You have to be a Facebook fan to purchase, tell your friends and get ready for a real bargain! Unsold items may be re-listed at another time - depending on interest and demand. I'll keep you posted! From Friday 21st Sept, I will start to email invoices according to how you want to pay. Your invoice will include postage costs based on how much you buy, weight etc. If you have multiple items and something larger, I will post in my hard gift box which will be a $10 flat fee. If you are only purchasing a small hair pin or headband on elastic it should go through as a 'letter' and the cost will be significantly lower. I am happy to combine postage with a friend if you tee it up with a friend/relative. I am happy for customers to pick up also if you live in Canberra. I will post items ONCE PAYMENT has been confirmed and will contact you to let you know it has been sent. Postage for multiple items will be combined. • You are welcome to pay through Paypal or Direct Deposit. • Direct deposits typically take 2-3 banking days to clear and is preferred so I don't have to pay fees. • I will send your purchases via standard mail (3-6 business days) unless you indicate that you would prefer express / registered and are happy to pay the extra $. • I will be posting standard Australia Post airmail as it is the cheapest for you.